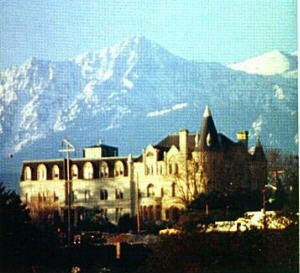 The Castle was completed in 1892 as the home of Charles and Kate Eisenbeis. Mr. Eisenbeis was a prominent member of the early Port Townsend business community. The Eisenbeis built what was the largest, private residence ever built in Port Townsend. Locals referred to the building as the "Eisenbeis Castle;". Charles died in 1902 and Kate remarried a few years later. The Castle was left empty for almost 20 years except for a caretaker. In l927 the Jesuit priests purchased the building for use as a training college. They named the complex Manresa Hall after the town in Spain where Ignatius Loyola founded the order. The name Manresa Castle is a combination of the two former names, "Manresa Hall" and "Eisenbeis Castle". Visit the Manresa Castle web page. To return to this page, click on the BACK button.